The use of roller compacted concrete alias RCC is restricted to the sub-base of roads and airfield pavements. It is also known as lean concrete or dry lean concrete. While developing a good surface, this type of concrete can be arranged quickly. RCC mix comprises of low cement content roughly 110 to 120 kg/m3 along with washed aggregate of concreting quality. As per the American Concrete Institute (ACI) section 207.5R-89, this type of concrete is described as concrete compacted by rollers. Cost and Techniques: The method of RCC itself will minimize the construction costs since it is not necessary to utilize rebars or forms. As an average, the cost per yard of RCC is roughly $75 per cubic yard whereas the cost of Hot-mix Asphalt pavement is about $90 per cubic yard. Therefore, lots of money are saved with the application of RCC. Besides, there are specific products which are applied to enhance RCC surface as well as employed to the RCC mix like RCC Surface Pro to make the appearance of surface better and enhance the durability whereas ACEiT admixture can boost workability. • The quantity of water should be checked cautiously and after water is mixed completely further addition of water should not be done. • RCC should be arranged within 60 minutes else there may be issues with joints in due course. • Minimum thickness should be retained as 4-inch layer and highest thickness should be 10 inches. You can opt for a single lift. • Saw cuts should be at a minimum 1/4 inch and placed minimum two times the thickness of the section, in feet. • Proper curing of concrete is important to get good result. • The consumption of cement is reduced since the leaner concrete mix can be applied. • The costs of formwork are also reduced or eliminated due to the layer placement process. 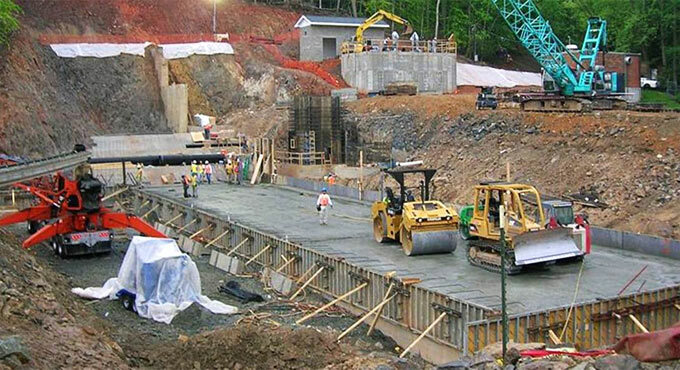 • The transportation cost, placement, and compaction of concrete are reduced as the concrete is conveyed by dump trucks; spreaded by bulldozers and compacted by vibratory rollers. This concrete solution is applied to keep traffic open and large volumes of RCC are arranged easily. Generally, RCC is mixed at or close to construction sites, and then conveyed with dump trucks and set into an asphalt paver equipment. Then the RCC is placed in lifts with 40 feet wide and 10 inches thick. The concrete is set through continuous layers and is compacted with vibrating rollers. Process: As soon as the product is arranged, compaction process should be continued unless the concrete pavement satisfies density requirements. A water cure spray or irrigation systems should be applied so that the concrete becomes wet and attains a smooth surface. To keep perfect workability, the concrete mix should be dry enough to get rid of the sinking of the vibratory roller. This process facilitates the chemical reaction that results in hardening of concrete and attaining strength to begin and complete. After being cured, the pavement is prepared to be utilized. Sometimes an additional layer of asphalt surface is used over the concrete for better smoothness or as a riding surface for high-speed traffic.